Jeff Bezos owns almost 79 million, or 16.3 percent, of Amazon’s approximate 477 million shares. They make him the company’s biggest shareholder and are a large part of his $137 billion net worth. But the Bezos’ divorce could see Jeff’s stake in the firm drastically reduced if he’s forced to give half of them to MacKenzie. An 8 percent stake would put her ahead of the company’s second-largest stakeholder, Vanguard, which owns 6 percent. Washington State, where the couple lives and is home to Amazon's HQ, is a community property state, which means any assets and debts accrued during a marriage must be divided equally in the event of a divorce. As Amazon was founded after Jeff and MacKenzie were married, she could end up with half of her ex-husband’s shares. 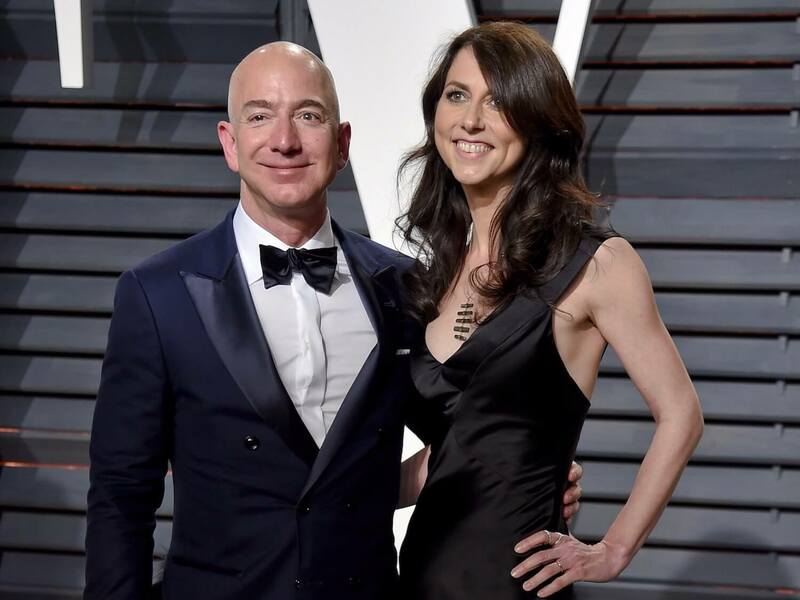 If the couple does file in Washington State, which seems likely, it appears that the only way MacKenzie won’t walk away with a large stake in Amazon is if the couple had a prenuptial agreement. But according to TMZ, citing “sources with direct knowledge,” they did not. There’s concern that Amazon’s stock price will tumble if MacKenzie opts to sell her shares, though she’s expected to hang onto them, which could give her a lot of power when it comes to voting on company policies. There are several things to remember here: in addition to whether or not the pair had a prenup, the decision on whether the shares are divided could come down to how a judge classify Bezos’ stock, and whether their increase in value was solely down to his work at Amazon. Additionally, even if MacKenzie gets them, Amazon may restructure to ensure that Jeff still owns enough voting power with his stock. There’s also the possibility that the sharing of assets was agreed before the couple announced their divorce. The pair said the decision to separate was amicable and that they remain friends, but some tabloids claim Bezos was having an affair with former TV anchor Lauren Sanchez, which, if true, could see proceedings turn ugly. Check out more of Jeff Bezos in our 'Drama, Drugs, and Data: A profile of 10 top tech CEOs' feature. Ahh... more clickbait.... any REAL information since the divorce was announced? I believe that's a NO... really Techspot, what happened to tech news? mbrowne5061, Unusual Kmc, ShagnWagn and 3 others like this. Clickbait consistently brought to you By **Rob Thubron**. Plenty of clickbait brought by other others too... the original divorce article was fine - while many can debate it's "tech-relatedness", at least it was NEWS. This is simply conjecture, with no added information whatsoever, and certainly no actual "evidence". You'd just not bother contesting anything wouldn't you? If dividing your net worth by half still leaves you with $68 Billion, would you really quibble? Who's contesting? We don't even know if they've decided to split their assets at all! This is all complete conjecture. If dividing your net worth by half still leaves you with $68 Billion, would you really quibble? It could be the difference between taking your company to the next level or not. Depending on how ticked off she is that he's been cheating on her, and, who's knows if she's been cheating on him. Most of these leftist uber wealthy types have open marriages anyway, this could be pretty expensive. But, unless she cashes in, nothing will happen. It's like when the stock market tanks. Unless you sell, you really didn't lose anything. I don't see why this article is on techspot, but I've always wondered why they value someone by their stock shares at current value. If said person were to sell their stocks, value would plummet and they would be nowhere near their value. Not at all. I suggested we cover this story. Amazon is one of the largest tech companies in the world and one of the Internet/Infrastructure/Retail leaders worldwide. If leadership can change direction because of any reason, divorce or not, then it's news. Lionvibez, Dimitrios, NightAngel79 and 2 others like this. I know. And I didn't say otherwise, I'm just adding in my own thoughts - sorry I'd thought this was a comment section. His point was that you covered it already, not that you shouldn't cover it. Nothing new has been learned, and this article only suggests hypothetical outcomes based on armchair lawyering and conjecture - hence, it is click bait. I disagree. If you read the two posts, they bring up two different angles of the same story, that doesn't automatically make it clickbait in our book. In neither story you will find alarmist or sensationalist style of reporting either. You're entitled to your opinion but I felt I should respond in this instance since I was the one to suggest we cover this perspective as a follow up. And I stand by that decision. wiyosaya, Spykezxp, MilwaukeeMike and 2 others like this. Hey Jeff... Know why divorce is so expensive? Maybe she found out he was a real robot? No.... a different angle? Explain? Without having any actual knowledge about this divorce (other than that is occurring), any other “angle” is simply conjecture - much like a tabloid would provide. Once there is more information provided, I’d be happy to read about it in a tech spot article. We should all chip in and send Mr. Bezos a condolence card. .
@Julio Franco FWIW it's worth, you can respond to Mr.Surprise until you're blue in the face. He's right and you're wrong, he'll tell you that himself. I'm pretty sure I earned a slot on his ignore list. You should be so lucky. (Although in my case, and to be "fair", they say like poles repel). lol When Squid opens his own blog then he can control what is posted and what is not. As it is right now he is entitled to his opinion but you don't run the show here boss. Last time I checked the site has an editor and his name is not Squid Surprise. "Squid Surprise posted a comment, and you WON'T BELIEVE Julio's reply!" "7 things Jeff Bezos's divorce taught us - Number 3 might shock you!" "TechSpot posted a conjectural article and THE INTERNET wasn't happy"
I see you've gotten your second wind. (Both in the figurative and literal sense).